Enjoy music outdoors with the chestnut brown Polk Audio Atrium Sat300 All-Weather Outdoor Speaker. 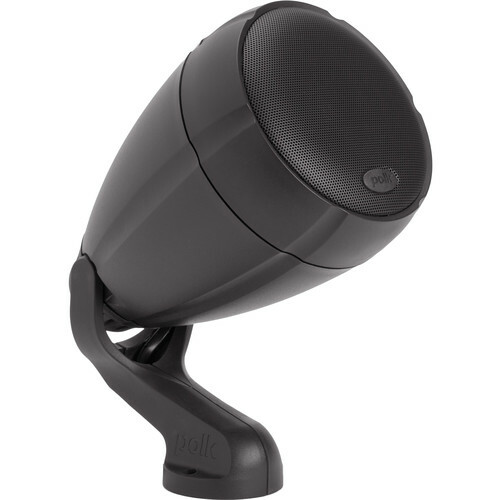 It accepts up to 100W from your amplifier and is IPX66-rated to withstand a variety of weather conditions. It can be installed in-ground with the included spike or hung from your roof or eaves with other included hardware. The midrange driver features a 3.5" long-throw cone with a 1" voice coil, vented pole-piece, butyl rubber surround, and composite cone; the tweeter is a 0.75" composite neodymium dome. The Atrium Sat300 can handle up to 100W of power for enhanced clarity, detail, and efficiency with less distortion at both moderate and higher volume levels, even in outdoor environments. The tweeter is bridge-mounted so that it doesn't get in the way of the woofer, helping to provide smooth, realistic sound. This is a signal-blocking technology designed to determine where a small speaker typically loses bass performance, then compensates by boosting the response in that range to help create a wider dynamic range with more musical realism. The Atrium Sat300 features a mineral-filled polypropylene housing, 1mm thick aluminum grille, and stainless steel hardware designed to withstand years of weather. It's designed to live outside year-round, with permanent color impregnation and all-weather waterproofing. The shock-absorbing gasket is engineered to withstand blows from weed whackers, mowers, and other lawn equipment, plus the included metal security plate can foil thieves, keeping the Sat300 planted in your garden. A 3.3' CL3-rated direct burial pigtail cable helps eliminate exposed wiring. Enhanced wiring flexibility is onboard with a built-in crossover. Also featuring a built-in high-pass filter, the Sat300 can be connected directly to its own amplifier channels for independent volume control. The Atrium Sat300 can be planted in your landscaping or hung from your ceiling or eaves with the included hardware. Box Dimensions (LxWxH) 12.7 x 10.12 x 8.7"